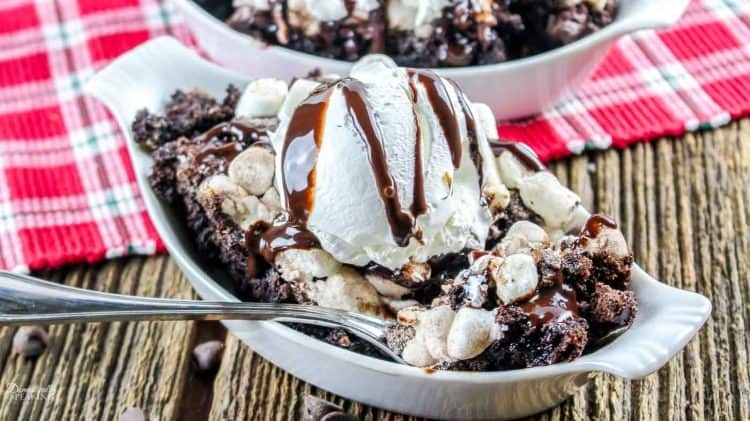 I’m a hot chocolate junkie during the colder months so I’m so excited to share with you this Hot Chocolate Dump Cake recipe! 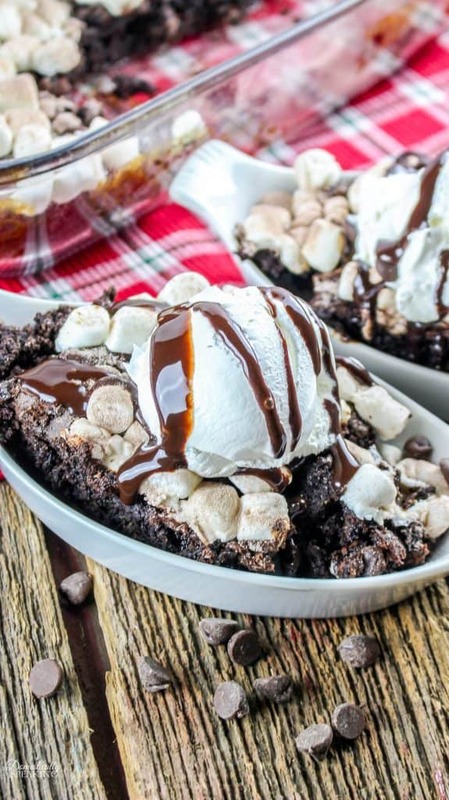 Gooey chocolate cake topped with melting marshmallows with that great hot cocoa flavor…. what’s not to love about this cake! Let’s get to how we make this delicious cake. You’ll start by combining the pudding mix, one envelope of hot cocoa mix and the milk. Then you’ll add the cake mix. Now its time for 1/2 of the marshmallows. 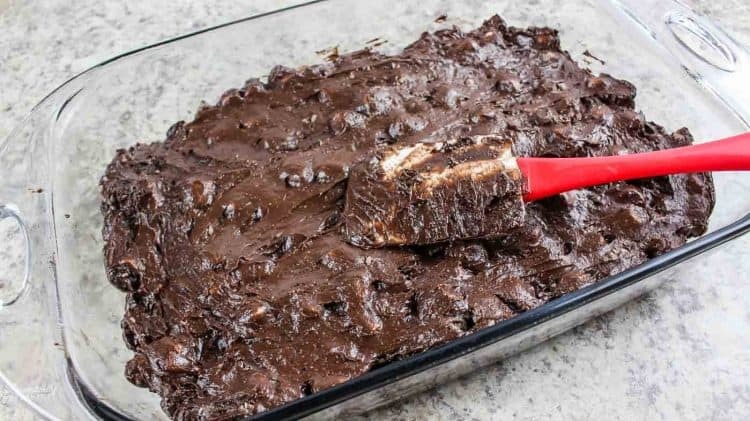 Spread the batter into a greased pan. 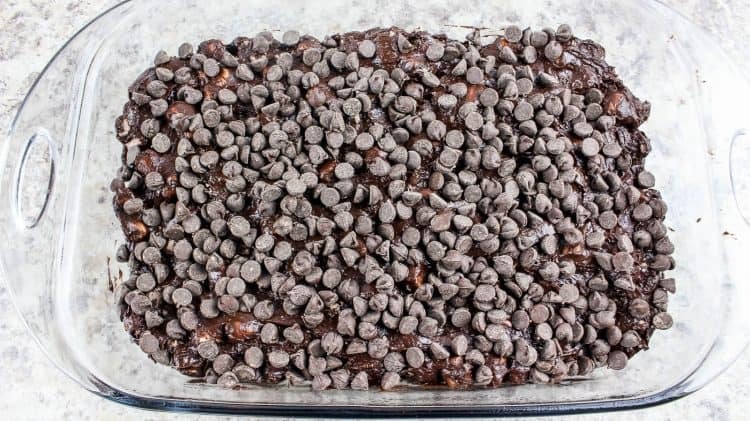 Sprinkle the chocolate chips on top of the cake batter. Now it’s time to bake the cake. 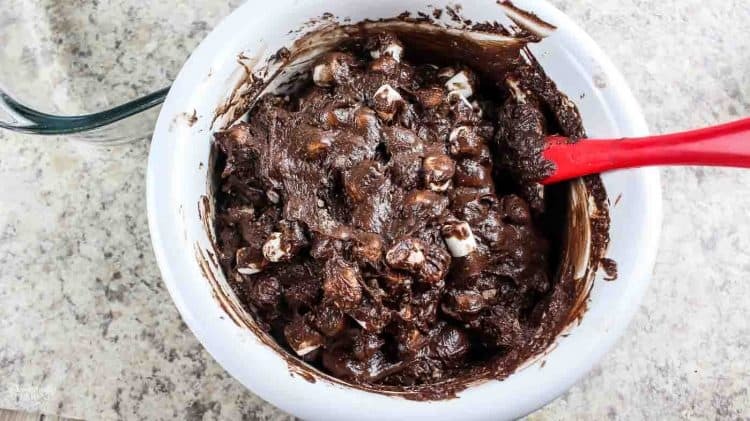 Immediately sprinkle the top with the rest of the marshmallows. Right before serving sprinkle with the remaining hot chocolate mix. 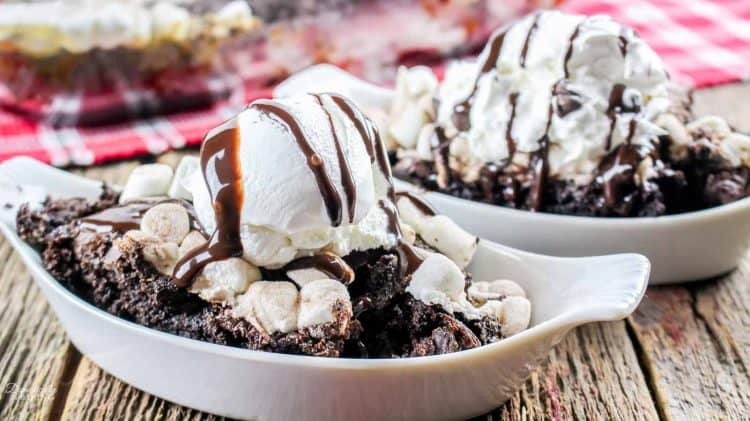 Serve with ice cream, chocolate syrup or whipped cream. 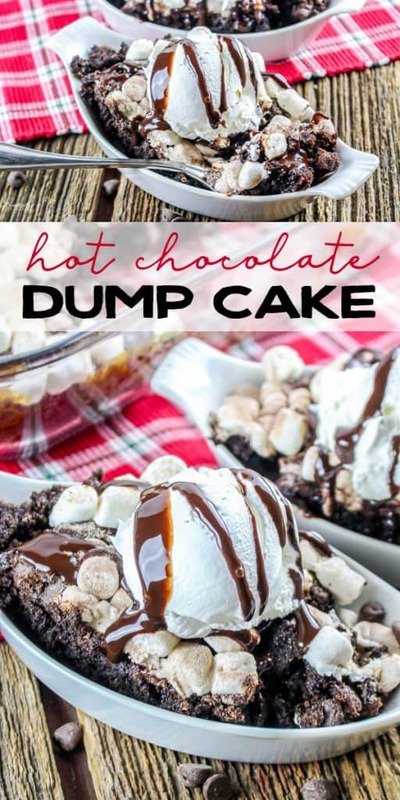 Hot Chocolate Dump Cake is a favorite for any chocolate lover! This easy chocolate cake topped with marshmallows is perfect during the holidays or anytime of year! Preheat oven to 350°. Spray a 13 x 9 pan with a cooking spray and set aside. 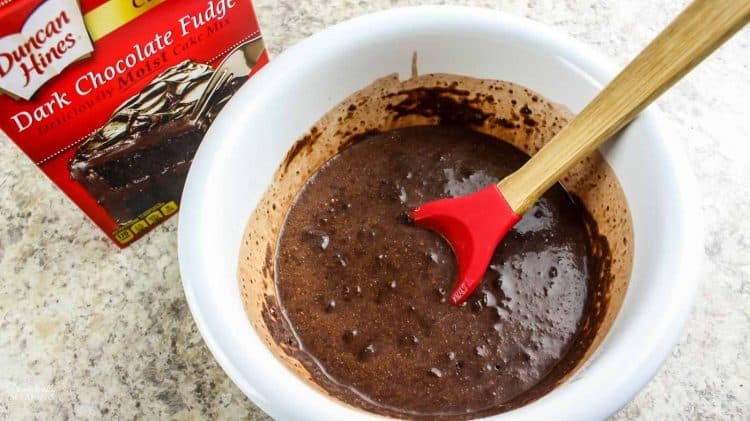 In a large mixing bowl, add the pudding mix, one envelope of hot cocoa mix and the milk. Whisk to combine. 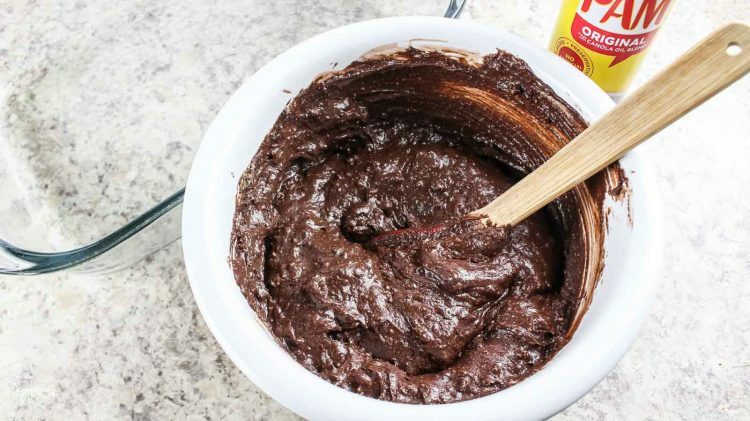 Stir in the dry cake mix until moistened. 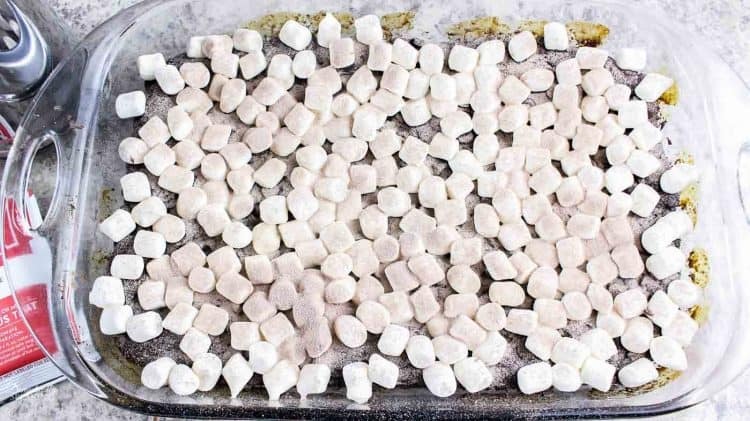 Fold in half of the marshmallows (2 cups). Transfer to the greased pan and spread out evenly with a spatula. 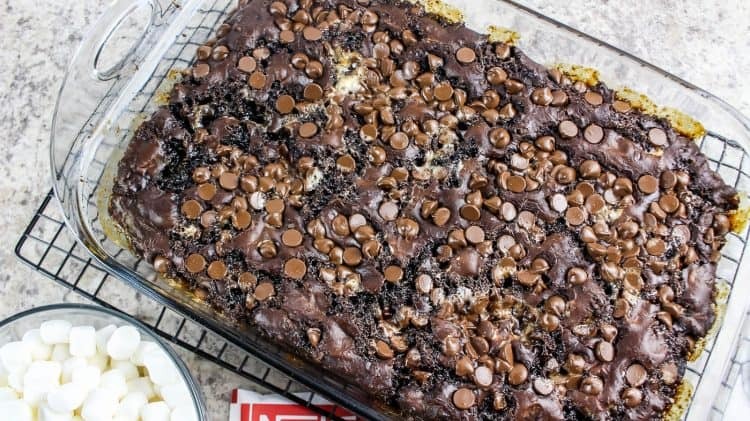 Sprinkle the chocolate chips on top of the cake batter. Bake for 35 minutes or until a toothpick inserted in the middle comes out clean. Remove from oven and place pan on wire rack. 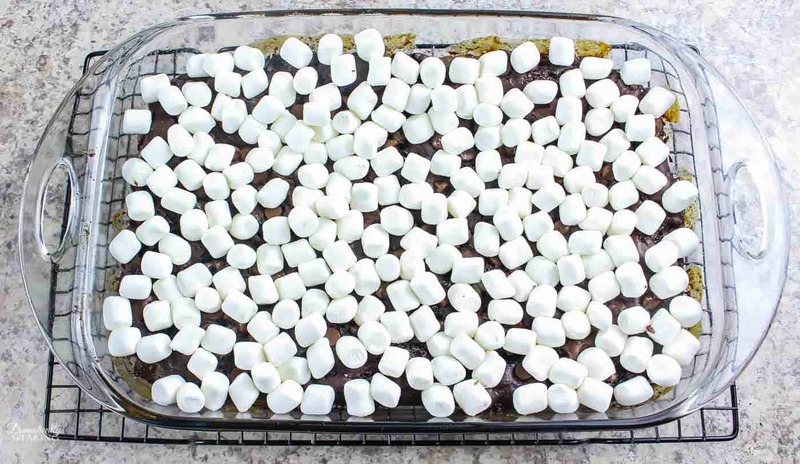 Immediately sprinkle the remaining marshmallows on top of the cake. Allow the cake to cool on the wire rack for one hour. Before serving, sprinkle the remaining envelope of hot cocoa mix on top of the cake (I used a sifter for even coverage). Garnish with whipped cream and/or a drizzle of chocolate sauce or chocolate chips. ENJOY!! Nope, just the box mix. I was wondering do you add the ingredients on the box of the cake as well as the other ingredients? I’m making this today for Christmas desert. I was wondering do you add the ingredients on the box of cake as well as the other ingredients? I’m making this today for Christmas desert.